Win Some Dough In This Sweepstakes! Join King Arthur Flour $1000 Sweepstakes celebrating 225 years of baking. One grand prize of a $1000 shopping spree and 5 runner up prizes of $225. Sweepstakes end September 30, 2015. KP duty in days gone by usually meant peeling potatoes–a relatively labor intensive, boring job. Now you can buy electric peelers designed to peel potatoes automatically. Some version of this has been around roughly since the 80’s, and unfortunately the expectations exceeded the reality. You are still better off using the old fashion peeler. But with so many on the market, how do you choose? 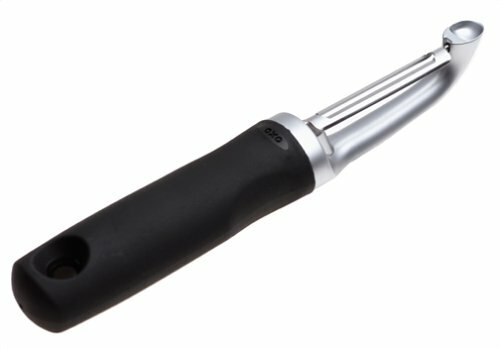 MarkdownMom likes the OXOGood Grips Pro Swivel Peeler. An item rated high by users and, what MDM especially likes features replaceable blades (sold separately) making it possible to just replace the blade when it becomes dull. Priced at $12.99 at Amazon. Black only. 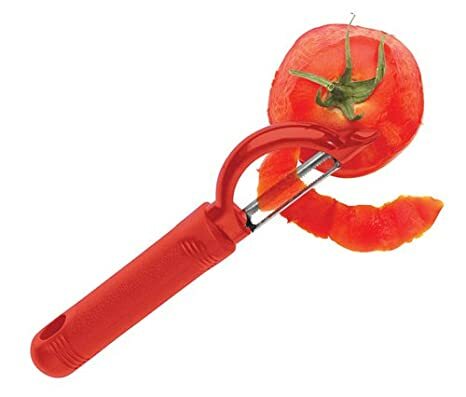 A second choice you might want to consider is the Messermiester Pro-Touch Red Serrated Swivel Peeler ideal for soft skin fruit and vegetables. Stainless steel blade. Consumers report it makes light work of peeling tomatoes, carrots, parsnips and even squash. Comes with a clip-on blade guard. Best price $8.47 at Amazon. Best Consumer Rated. Okay, we have all had it happened–suddenly we get an inspiration to bake, rare though it is, and unless you have a professional pantry like Martha Stewart or specifically planned to bake a particular item and you bought everything ahead of time at the grocery store–like we’re all so-o-o organized, right? You may be out of a particular item–say powdered sugar or super fine sugar. But don’t dismay if you have regular granulated sugar. Both Martha and about food suggest using granulated sugar and processing it with a metal blade for 5 minutes–use more than recipe calls for because some will turn into powder–and process for 5 minutes. Without and need powder sugar? Rachael says do same thing, but longer. Choosing Voluntary Simplicity suggests using a blender for better results since it breaks down the sugar crystals easier and in less time. Did you know commercial powdered sugar contained cornstarch??? Selection of end-of-season merchandise is a major impetus for bargain hunters to shop the Labor Day Sales. It’s true that 20% off will give rise to larger discounts in the ensuing months leading up to Black Friday, but fewer choices will also be available. 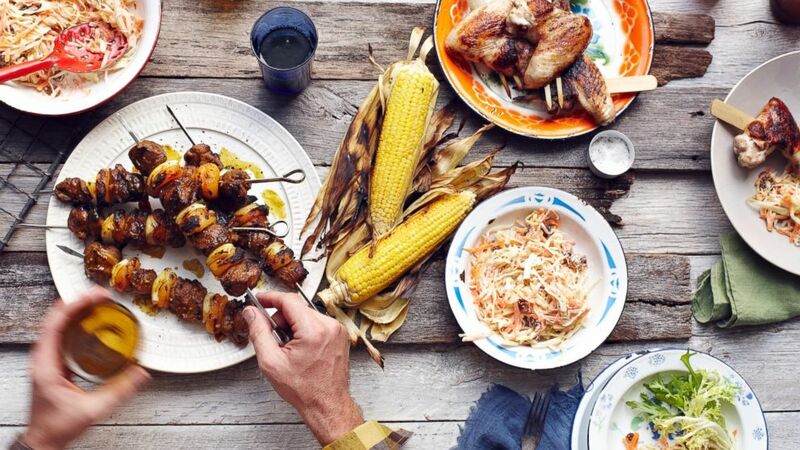 If you are grilling this weekend–and who isn’t? You may want to check out grills especially if your grill is experiencing that ‘ole shipyard rust–a nice industrial decor look, but not great if you have it flaking on your burgers! 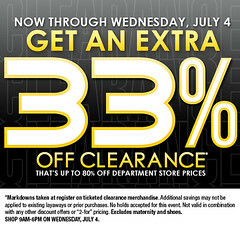 Check out the freebies that Regina Conway, consumer expert with Slick Deals, mentioned on ABC’s GMA for this weekend. They include food deals and even free AAA towing in certain states if the old clunker gives up the ghost. MDM suggests if that happens have them tow it to a car dealership offering Cash for Clunkers. Near County Road C in Maplewood, Minnesota, in one half of a brick building, is housed a meat market that not only carries spectacular cuts of meat for the dinner table, but also items that cater to the gourmands among us. The Angus Meat Market assaults your senses and eyes when you walk in with the smells of hickory and smoke, and an array of meats including every cut of steak imagineable, jerky in a variety of flavors made from beef, turkey and chicken, and double-smoked hickory bacon. What drew MarkdownMom to this site was their large sign heralding “Double Smoked Hams.” For the holidays, this is a must have and your quests will rave at the moistness and flavor of their hams, and for that special occasion you can even order a whole pig for roasting! For those who culinary tastes are more adventurous, this market carries specialized meats such as alligator and smoked alligator and kangaroo (delight for all those Crocodile Dundee fans), bison, elk, kobe/wygu (Japan) patties and steaks, farm raised venison, wild boar, goat and grass fed beef can be ordered! Besides free range chickens and turkeys, they carry small birds including quail, cornish hens, and partridge. .For the hunters, The Home Market processes all kinds of game. For you favorite pooch, they even have dog treats–the lists goes on and on. And what ‘s equally important, prices were more than competitive–like 95% ground beef for $4.99/lb! Oh, MarkdownMom mustn’t forget that the other half of the brick building houses the family’s liquor store. One stop shopping to pick up that special beverage to go along with your delicious meals. This Is One Family-Owned Business where family pride is shown in the quality of their product!!! Cookie Exchange: Good Deal or Not??? The Holidays are an endless source of approved indulgences. A time to make merry, and to sample all the goodies this special season can offer–and, oh my, yes there are many! Ho, Ho, Ho!!! 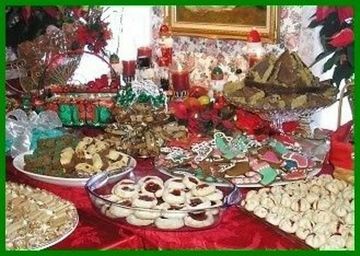 For example, Christmas cookies, so many to choose from and don’t they look wonderful and colorful on a sideboard. But to get a nice assortment from a bakery, it’s easy to spend $50-$75 for these confections. The light bulb turns on with a bright idea: A Cookie Exchange! The Cookie Exchange was born to answer the call of hostesses with the mostest for creating that last pièce de resistance for their buffet table–with less fuss and small muss. Great idea, win-win, right? However, not all Cookie Exchanges are created equal and may be more work than you expected. The idea is to make 1-2 dozen of one type of cookie for each participant –the more participants, the more variety of cookies. In theory, if you have 12 participants, you make 12 dozen cookies of the same recipe to exchange and you receive 1 dozen each of 12 different holiday cookies creating a beautiful assortment for your table. Right??? Maybe not! Know the baking abilities of all participants. Just like planning a family potluck dinner–there is always one kitchen challenged relative you ask to bring either an hors d’oeuvres tray or the green leaf salad. Look for Pillsbury Bake-Off Winners! Know ahead of time the cookies they will bring to avoid duplication. Additionally, you do not want to spend oodles of time and expensive ingredients and exchange for cookies of less effort and quality. Cardinal Rule: no substituting homemade with store bought if that happens, you either keep her/his portion of your cookies, or depending how insulting that store bought cookie is–say an Oreo–you pelt them with their share of your cookies and blacklist them from future Cookie Exchanges. No cookies made ? Even though you agreed to participate, save yourself the embarrassment, call in sick. A successful Cookie Exchange should be photographed and accompanied with recipes–in a number of years, you’ll have a book! Give ribbons for the best decorated, flavorful, etc.–a quality control incentive. ****Better yet, sign up for a Cookie Exchange offered through Community Education of your local school where you can go and make and exchange cookies in one night. This way, you get an assortment, somewhat smaller, but you don’t have the clutter and disruption in your kitchen, you meet new people, plus you may gain a a few tips and baking shortcuts, and you can always blame the instructor! Retailers learned their lesson following 2008 crash that controlling inventory became key to improving sales. What they did not count on was a continuing decline, not only in the purchasing power of consumers, but also the on-going decline of the middle class that began in 1980 and continues today. Food always has been competitive with narrower profit margins than most other businesses; however, it was somewhat recession proof since consumers could forgo buying a new car or the latest fashion, but everyone has to eat, right? However, now grocery stores have begun to control inventories beyond seasonal items and what this means for the consumer is a decline in the number and type of selections a store will carry. Add to this natural causes such as drought, floods, and shorter growing seasons, that have increased prices substantially on beef and pork, and the consumer increasingly is being placed between a rock and a hard place. As the middle class keeps losing ground coupled with higher prices, grocery stores are scaling back the volume and variety they offer in almost every department. How many times have you experienced going to either a warehouse store or local grocery store for a staple that you have been buying for years, only to find that it isn’t being carried by the retailer anymore? Are these products no longer being supplied? In some cases, yes—some businesses have closed either through competitive attrition or retirement in family-owned businesses, but not all. Stores are cutting back on what they consider gourmet items but also on staples if price is prohibitive and sales are limited due to the makeup of their clientele. What this means is that many of your favorite items will be harder to find and indirectly will affect the type of meals you will be able to offer your family. Additionally, prices will increase as competition declines. What this means in the long run for the overall nutrition of your family is difficult to determine. MarkdownMom does recommend increasing community gardens and individual gardens to the level of WWII Victory Gardens, and continuation of developing relationships with local farmers, local farmers markets, and learning canning and other food preservation methods. Until the middle class starts to see signs of an economic recovery, going to the grocery store will require employing all the savvy consumer skills you have to survive sticker shock! How Many Ways Can You Waffle? 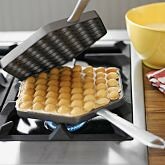 Regular waffles, Belgium waffles, waffle sticks and now Nordic Ware introduces its Egg Waffle Pan. A favorite street snack from Hong Kong, means little eggs, that provides an on-the-go light pastry. This cast aluminum nonstick, hinged, interlocking pans provide even heat cooking, easy release and clean-up. At Williams-Sonoma $49.95, recipe included. No, this isn’t about political primaries!